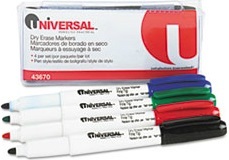 Get a streaky mess when you try to write with your Universal® Pen Style Dry Erase Marker UNV43671? Time for a new pack. But while you wait the day or two for your new markers to arrive, there are a couple things you can do to eke out a little extra life. 1. Revive your dry erase markers by flipping the tip. Take apart the marker barrel and remove the ink cartridge. Use a pair of tweezers or needle nosed pliers to pull the the tip out from the head of the marker. Reinsert the felt tip into the head, then reassemble the rest of the marker. Voila! Now your dry erase marker is [almost] as good as new. 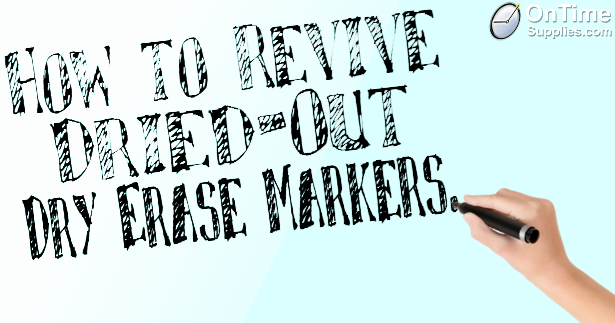 Another way you can revive your dried out dry erase markers is giving them a bath. 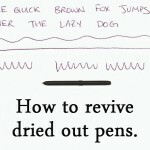 We’ve talked about how hot water works to revive dried out pens. The concept is just the same for dried out dry erase markers. Pour a cup of hot water in a bowl you don’t mind potentially staining. Place your dried out dry erase markers in the bowl tip first and let them set for about five minutes. Remove your markers and place them uncapped on a dry towel for 24 hours. Presto, chango, your markers should work just fine for a little while longer. Remember, the #1 way to keep your Universal Dry Erase Markers from drying out in the first place in store them with the caps on. It also helps to store them standing in a pencil cup with the nib side down. That way, you corral gravity into helping you preserve your markers. Got a tip for reviving dried out Universal Dry Erase Markers? Post your suggestions in the comments. We purchased these black dry erase markers for several schools, but we wanted to try them out with a smaller order first. We are pleased with the product. It provides a nice, dark line and erases easily. The fine tip allows for precision, but it is not so fine that the line cannot be seen from the back of the room. The cap holds securely, which leads us to believe that the pens, properly capped, will be long-lasting. The price is right. Compared to other comparable pens, it is quite low — very reasonable. Delivery was incredibly fast. We received the pens in two days. It looks like we will be ordering a bunch more, as these pens meet the needs we anticipate in the classrooms that will be using them. method two didnt do anything. in fact a barely living marker became fully dried and dead. And that, Mr. Mcgee, is exactly the same result I got. Thank tech that our children will probably not trifle with such things, as the future is digital. Warm a talk shot glass of vodka in microwave for thirty seconds. Stand the uncapped dry erase marker in the glass for 3-5 minutes. Using pliers, gently twist and flip tip over. Your pen has been REVIVED! DISPOSE OF ANY REMAINING VODKA. It&apos;s been tainted with isopropyl alcohol. DO NOT DRINK! Soak your pen in rubbing alcohol. 5 min and presto, tip is now working!! How do I fix a dry erase marker that has darker marker colors stained on it? 4. Reassemble with the new tip on the outside ready for use! Using a small sharp pair of scissors, snip off thecstained part. Then use your scissors to make the point the way it should be. My dry erase pens are only two weeks old and I only used one, one time. They are already dried out. Three were never even opened. All were stored nib side down and closed. Any ideas? I&apos;d take them back to the retailer, probably defective from the beginning. If I own a product 2 weeks, use once and it stops working…. I take it back to the store. Wikipedia had an awesome simple trick that really works! -Take long piece of string or yarn ,about 2ft. in length, and tie one end around your marker towards the back end. * make sure to tape it down so the marker won&apos;t fly off and it something or somebody. * also make sure the marker cap is on securely as this could cause ink to splatter if it&apos;s not. – Then hold it above your head and swing it around like a lasso for about 1 to 2 minutes. – Then take off the cap and write. Gravity and force do all the work here! It&apos;s so cool! The gravity and force pushes the ink from back to front. Wow! It works just fine. Just do not make the mistake I made Try this outside away from things that can get ink spots . I just move it fast with my fingers but be careful because a lot of ink came out. OMG this works. At first I thought you were a troll trying to make us do something dumb but yes it works and yes ink splattered all over me. So be careful. This works like a charm. I just did it to all of my dry erase markers (would have been fun to explain why I was spinning my markers around on a string if anyone had walked in on me, lol) and they all write now! Like everyone else says, make sure the cap on or things could get messy. I opened up one to test after spinning and some ink dribbled out. Thanks!! how do you make fix a dry erase marker . Go to Google and type in how to revive an expo marker then hit search or enter. Do you leave the marker uncapped or capped in the warm water? Uncapped in the warm water. Good luck, Gianni! Try the lasso trick from Wikipedia. It really works! I found it on "wikihow.com". The title I think is how to revive dried out markers. You will have to scroll down past the water based markers first. That&apos;s great to know! Thanks for sharing, Rebecca! Holy cow. Perhaps the author confused dry erase markers with washable markers? 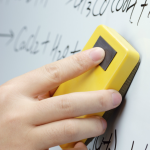 Unlike the author, most of us have noticed that dry erase markers have a distinct solvent scent. Armed with a nose, it takes nearly zero deductive skills to conclude that a solvent, not water, is s realistic cure for "the four year olds left the caps off the dry erase markers again." A quick internet search and two minutes of reading yielded a solvent mixture used in many dry erase markers. I did not bother looking for the proportions actually used, but am certain that a 1:1 combination of isopropyl alcohol and SD alcohol 40 (denatured ethyl alcohol) will perform better than diluting any remaining alcohol with water. Having identified a solvent, there&apos;s a couple more things to consider. First, using too much solvent could prove troublesome as it&apos;ll both over dilute the pigment and allow dripping from the tip. Second, applying the solvent to the tip of the marker will rinse the pigment into the marker, this leaving a hydrated marker that will not write. If possible, remove the back plug of the marker to add a few milliliters of solvent, then put the plug back in. If enough solvent was used, the marker will be writing fine in a few minutes. This can be sped up by slinging the ink toward the tip, but that can be very messy if too much solvent was used. If the plug cannot be removed, the solvent mixture can be added from the tip, but it will take a much longer time for the pigment to homogenize in the reservoir and tip. This can be sped up by using the sling technique described by the author, except that one must sling the solvent toward the bottom of the marker, not the tip. Do that a few times, allowing a few minutes between each slinging so the solvent and pigment can wick back toward the tip and mix. Use strong alcohol that is 90% or greater. A single alcohol may also work well, but the marker could dry out faster. This cure also works for permanent markers. Little tip i developed when my kids were leaving lids off. I asked a diabetic friend for a syringe. For their water-based pens, I used water, for dry erase pens, I use whiteboard cleaner fluid, for permanent markers, I use nail polish remover. I use pliers to remove the plug on the end, then tap that end of the barrel on the counter to bring the fiber color cartridge to where I can reach it. No sweat if it doesn&apos;t come out. This works either way. Fill the syringe with an appropriate amount of your fluid. Different amts for differing sizes… If the cartridge comes out of the barrel, I can see the progress of the fluid as it moves along (unless it is black). Take note of the amount you used in a "successful" fill, so you can do it again next time! I carefully put away the syringe (marked "polluted") where druggies or kids can&apos;t find it. You should soak the dry erase marker in the alcohol, uninterrupted, for 5 minutes.